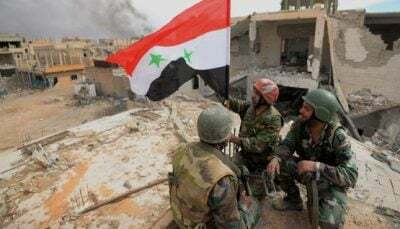 On May 26, the US Department of State released an official statement, in which it warned the Syrian Arab Army (SAA) from launching a military operation in southern Syria. The US claimed that such operation will be a violation of the US-Russian de-escalation zone, which was imposed in July of 2017. “The United States remains committed to maintaining the stability of the southwest de-escalation zone and to the ceasefire underpinning it. We also caution the Syrian regime against any actions that risk broadening the conflict or jeopardize the ceasefire,” the department of State said in its statement. The US also vowed to take “firm and appropriate measures” in response to any attack of the SAA in southern Syria and accused Russia, the SAA and Iran of violating several de-escalation zones and stonewalling the Geneva process. “Assad regime, with the support of Russia and Iran, has repeatedly violated these de-escalation zones, most recently in its brutal assault on East Ghouta. The Assad regime and its allies continue to prolong the conflict by ignoring their own de-escalation agreements and stonewalling the Geneva process,” said the Department of State. During the last few weeks, the SAA and Russia began their preparations to launch a large-scale military operation against the Free Syrian Army (FSA) and Hay’at Tahrir al-Sham (HTS) in southern Syria. From its side, Iran announced that it will not participate in such operation. Local observers believe that the upcoming military operation will cause significant tension between the US and the SAA and could lead to a limited military confrontation similar to the skirmishes we saw in al-Tanaf and Deir Ezzor.